Only three females with collars are still being tracked by USGS researchers in the Beaufort Sea and all of them spent August 2016 on the sea ice in the eastern portion, off the coast of Banks Island. Meanwhile, as Arctic sea ice nears the annual low, NSIDC predicts that 2016 will likely not set a new record but may bottom-out below 2007 (the second-lowest since 1979). 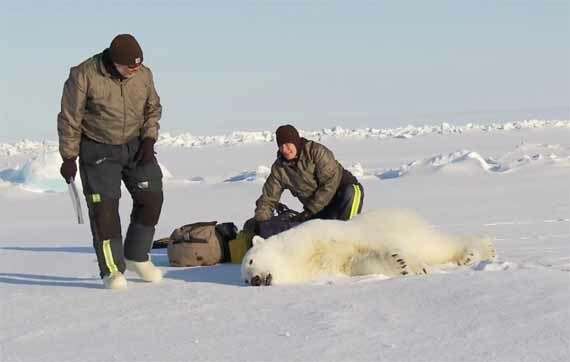 The impact of low September sea ice on polar bear health and survival, based on recent research reports, will be the topic of an upcoming post. I’ve combined the months of November and December for this post on USGS polar bear tracking in the Beaufort Sea because there’s not much to tell: there’s one tagged bear left and she’s going almost nowhere. Where’s the news in that? Movements of 1 satellite-tagged polar bear female for the month of November, 2015; shown with sea ice coverage at 30 November 2015. This bear was tagged in the spring of 2015 in the Southern Beaufort Sea. See original image here and December movements below.